Mexico City (Agenzia Fides) - "We congratulate Mr. Andrés Manuel López Obrador, who according to the preliminary results of the National Electoral Institute, has been declared the winner. We are all called to collaborate positively with our elected authorities. We can only create better conditions of development for all, if we commit ourselves in first person. No ruler has all the ideas and solutions. It is our responsibility to continue to participate with civic sense, always respecting human rights and the true common good": this is the communiqué of the Mexican Episcopal Conference (CEM) which congratulates the new President of the Republic, winner of the elections held last Sunday , 1 July. 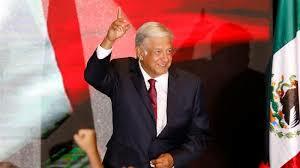 Andrés Manuel López Obrador, at the head of the left-wing coalition "Juntos haremos historia", won with more than 53% of the votes, which would be the largest winning margin seen for many years in Mexico. Furthermore, the percentage of voters was very high on this occasion. The CEM press release, sent to Fides, continues by pointing out the priorities of the Mexican reality: "Education and the fight against poverty, truth, freedom, respect for difference and the search for consensus are ways to overcome inequality, selfishness and abuse. We reject the acts of violence which occurred in some parts of the country, especially those against human life", concludes the text, signed by the Archbishop of Guadalajara and President of CEM, Mgr. José Francisco Cardenal Robles Ortega. Fides also received from the Archdiocese of Mexico City, the letter of Cardinal Carlos Aguiar Retes, primate Archbishop of Mexico, who greets not only the provisional presidential winner, Andrés Manuel López Obrador, but also Dr. Claudia Sheinbaum Pardo, who will be at the next head of government. "We pay special recognition to the millions of Mexicans who gave an example of democratic maturity by going to the polls to exercise their right to vote in an orderly manner", reads the letter. "Now it is up to all of us to work with our authorities so that the desired transformation, which society has asked for, can be made effective, so that the country takes a positive direction and poverty stops hurting the social fabric; so that Mexico reaches an optimal level of development and criminal acts cease to be the distinguishing feature of our country", reads Cardinal Aguiar Retes’ letter.